Who are we to judge the investment prowess or possible misstep of either self made man. They are in fact both billionaires many times over - granted, one significantly more than the other. That said, we find the difference of opinion interesting, considering their respective approaches with capital and age. Buffett's unabashedly popular, 84 and in the twilight of his legendary investment career. Beal is 62, press-shy and arguably in the sweet spot of growing a private banking empire. Notoriously conservative when it comes to risking his bank's capital, Beal pulled his bets early in 2004, concerned about the already frothy conditions prevalent in the commercial and residential real estate markets. Patiently waiting in the wings as the financial crisis swelled and swallowed the market in 2008, Beal placed his chips and took an early piece of the pot in the distressed debt markets. Today, Beal has his private bank squarely focused on energy companies, whose credit prospects have soured, as regional banks collectively shun financing with the price of oil plummeting over the past year. "When oil was $130 a barrel they were all lending like crazy. Now it's $50, and they don't want to make a loan", said Beal. Where public companies now see immanent risk in the energy sector, Beal finds tremendous opportunity. What does he see that they don't? Put simply - relative value, without the condition of satisfying shareholders immediate concerns. From his perspective, the collapse in the price of oil today offers more opportunity in the energy sector over the long-term than say the U.S. equity markets. "I'm not predicting a crash, but there will be a lot of disappointed investors", he said. At the end of the day, quarter - or year, what really matters to investors such as Beal or Buffet is the relative value and risk of their invested capital over the long-term. If they estimate correctly and size accordingly, outperformance will take care of itself. For Buffett, the shear size of Berkshire Hathaway has made it increasingly difficult to move the needle. Thirty years ago, he would routinely outperform the S&P 500 by over 20%. With Berkshire Hathaway swelling to the fourth largest publicly traded company in the world - it's closer to 3% these days. All things considered, it's still impressive and reflecting back over his career in its entirety - it's an unparalleled colossal feat. So why is Buffett divesting his shares in Big Oil as investors such as Beal see great relative value in the sector? For starters, he's managing a very large and complicated conglomerate of interests and will likely use the proceeds to fund new opportunities he's had better luck with in the past - such as the acquisition of Kraft by Heinz. Over the past several years, Buffett's hot hand has been twice rebuffed by his investments in Big Oil, buying ConocoPhillips near the peak in oil prices in 2008 and selling that investment for a substantial loss in 2009. We know at that time he used the proceeds to help fund the BNSF Railway acquisition that went on to generate billions in profits for Berkshire. Today, he's likely looking to do the same by exiting Exxon with basically a marginal profit from his 2013 investment and putting that capital to work in an area he has had greater success with in the past. Will it bear the same fruit that the BNSF Railway acquisition provided Berkshire shareholders? From our point of view - not likely. When it comes to the recent Kraft acquisition, Heinz is paying top dollar for a company that generates a modest return - even if they succeed at lifting the same operating margin to where Heinz currently enjoys (~6% post-tax return on capital). Moreover, the public equity investment in Kraft will very much be at risk to the whims of the U.S. equity markets, which from a variety of metrics is richly valued relative to world indexes and other asset classes - especially commodities. Despite the carnage witnessed in the commodities market over the past year, we've gravitated to the relative value opened up in some of the hard asset sectors - such as oil and precious metals. To a large extent, we approach precious metals as simply a higher beta emotional proxy of the same investment thesis. A thesis that is either propelled ahead or anchored to inflation expectations and greatly motivated by trends in the dollar and real yields. With the U.S. dollar index recently stretched to a relative performance extreme (see Here), and with inflation beginning to move out of the trough it has remained in over the past two years, the long-term prospects for hard commodities remains extremely attractive in our opinion. 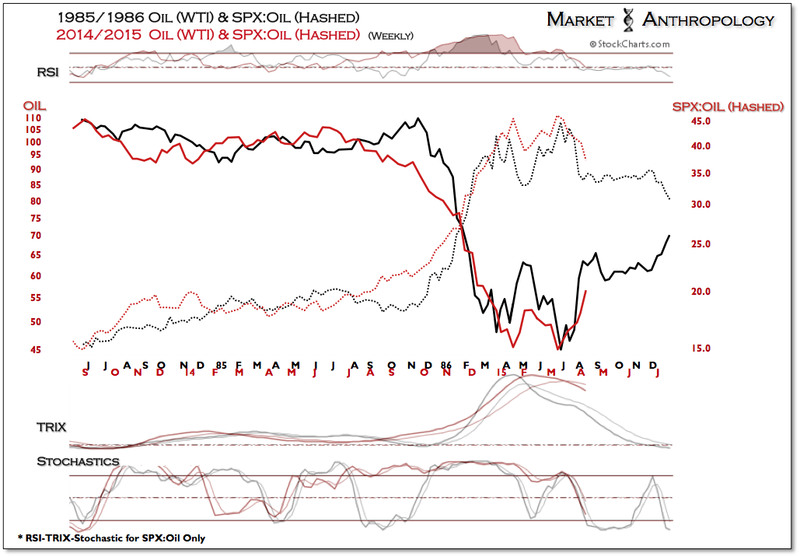 A relative performance chart that frames what we suspect will be shrewd timing on the part of Beal - and which we have closely followed over the past year, is the SPX:Oil ratio. Our general impression reflected by the ratio is that markets are currently traveling away from a cyclical pivot from the disinflationary trend that began in 2011, to another reflationary upturn. 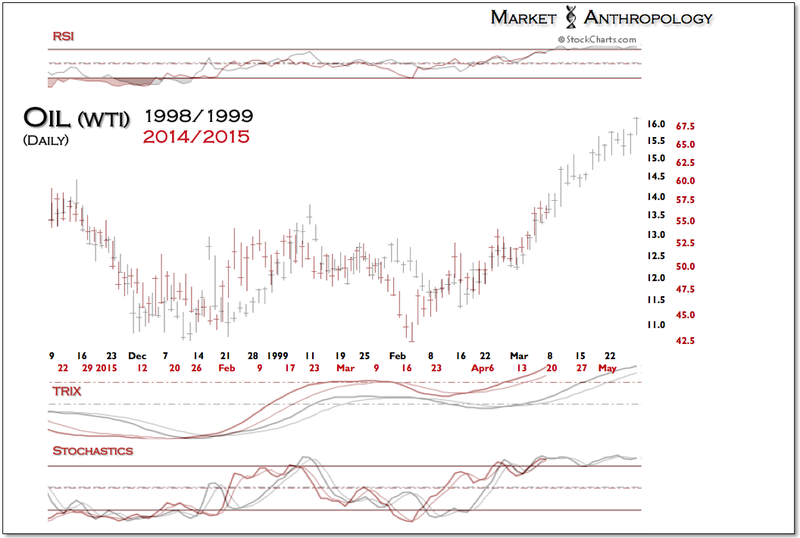 As shown below in the chart, there is a broad asymmetrical structure in the ratio, defined by the blowoff moves in 1985/1986 and 1998/1999. Both moves were completed in market environments where equities strongly outperformed commodities, as oil prices collapsed - reinforcing a powerful positive disinflationary feedback in equities. In 1986, the oil market stabilized after the supply-driven decline was absorbed and the Fed eased aggressively in the first half of that year. 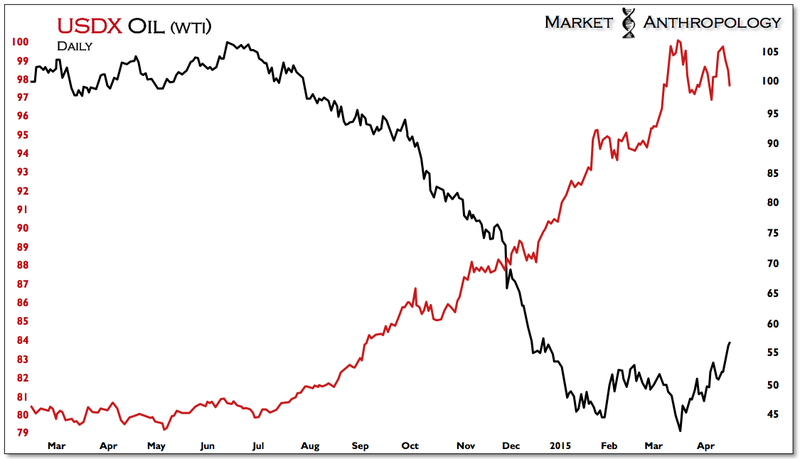 By the end of 1986, oil prices had risen nearly 70 percent above the lows from late March. 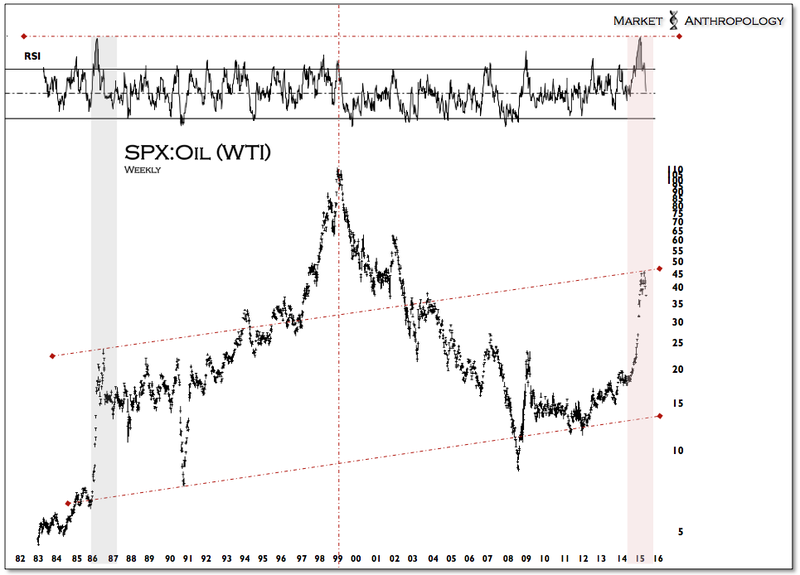 The relative performance between equities and oil would remain range bound over the next decade, as the ratio worked its way higher, ultimately breaking out in 1997. Over the past several months, we have contrasted the comparative performance and price structures of the 1985/1986 supply-driven decline, the 1998/1999 secular blowoff and the large demand-driven crash in oil in 2008/2009. 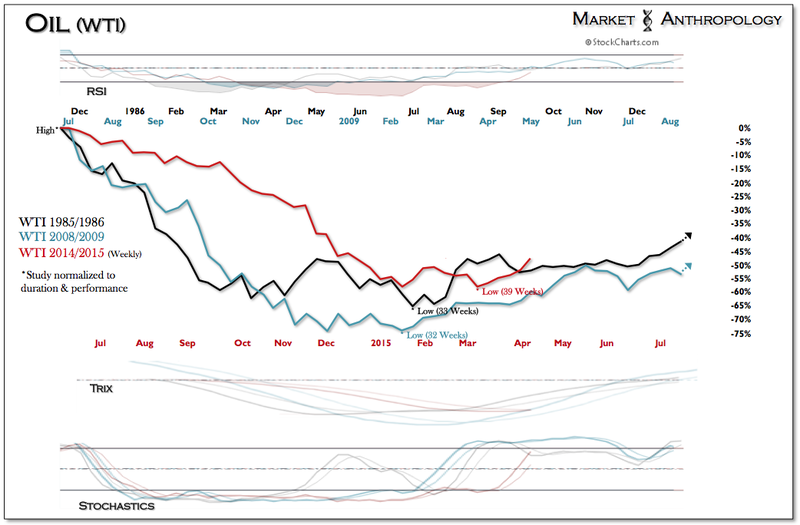 Although we firmly agree with Beal that anything can happen over the short-term, from a variety of perspectives, oil appears to be moving constructively out of another major low and away from the cyclical disinflationary trend that had broadly worked against the commodity markets since 2011. In fact, from a comparative perspective with the 1985/1986 blowoff, the current market appears to be completing the pivot faster than initially estimated, with the ratio breaking down sharply below the lows from late January last week. All things considered - and as revealed in previous notes with insights drawn from the 1940's low-yield market environment, we are more inclined to speculate that the ratio will trend lower as it did from the 1998/1999 pivot, as the equity market rally cools in the U.S. and commodities once again take the outperformance baton.